As the days grow darker, longer, I have to remind myself: the light is coming. By this I don’t mean just the Winter Solstice, Dec. 21 for us this year, when the longest night of the year gets things as dark as they’re going to get, and the light starts coming back. Our ancient ancestors used to light bonfires to help retrieve the sun, much like we do by drenching our homes in bright winking lights today. No, I also mean the spiritual light of Christmas, which despite its runaway commercial sleigh still bathes the culture in a spirit of generosity, as well as holding deep religious significance for Christ followers. And I also mean the light in children’s eyes, wide with delight, surprise and wonder. That is the light I miss most at this time of year. For I remember its glint in my own children’s eyes, Max and Emily lighting up as they bounded down the stairs Christmas morning. And I remember it in my own heart, as my bare feet padded down Nana’s carpeted stairway in the magical quiet of early Christmas Day. Nearly 20 years ago I wrote about this special wonder, in my religion column for The Grand Rapids Press. I include it here, because it is worth reminding myself of, and hopefully will remind you of the wonders of your own holiday traditions. As we grow older, it is good to keep that childlike wonder alive, like the flickering flame of a votive candle. 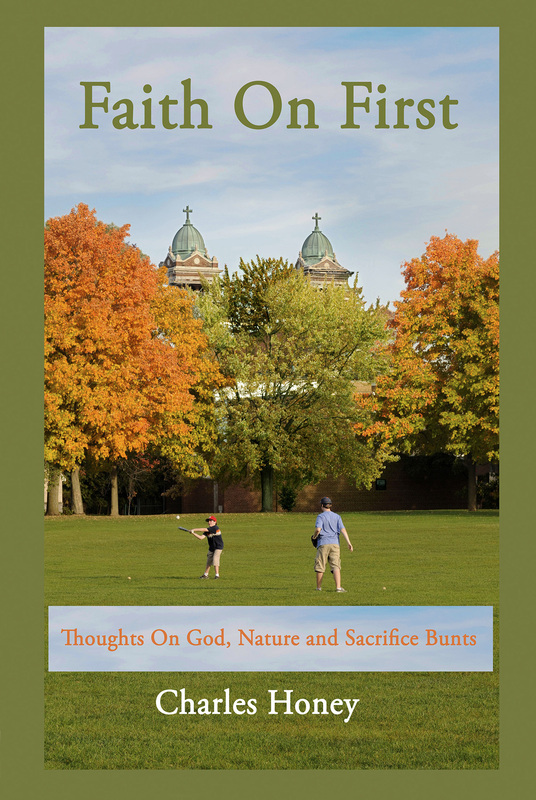 This piece is included in my collection of columns, “Faith on First: Thoughts on God, Nature and Sacrifice Bunts,” which includes a chapter on holidays. Here is a bit of the Christmas wonder I felt as a child. I hope it lights some special memories in you. Christopher deVinck can still see the long, veined hands of his father holding a toy soldier and turning the key. It was a moment of unexpected intimacy. Jose deVinck had taken an instant to show young Christopher how to work the soldier, just out of its Christmas package. Why this image should stick with Christopher, now a 44-year-old author, is curious. Surely more dramatic things have happened in his life. But this moment held something rare and lasting. The resonance of the word itself suggests its rarity. You can’t apply it to too many things. When you experience wonder, you feel it. When you don’t, you feel that, too. Amazement, suspense, adrenaline highs: Those you can get at a movie theater, a football game or a Cedar Point ride. Wonder is not obtainable. You just have to notice it when it happens. Personally, I don’t notice it often enough. DeVinck made a point of noticing by writing about it in his new book, “Simple Wonders,” published by Zondervan of Grand Rapids. A hand-sized collection of meditations, the book describes such wonders as ordinary trees, elephants or an old woman who says she has God in her knitting basket. It begins with deVinck skating on a frozen swamp as a boy. He stopped, kneeled and swirled his glove on the ice’s surface. Through the glassy ice, he saw a goldfish looking up at him. I listened fairly patiently. I had to decide to focus on the conversation, feeling the pressure of things to do pushing on my mental periphery. Even now, other tasks tug at my attention as I write. News events demand to be covered, issues beg to be addressed, our house must be made ready for the season. So to sit and write about something as ephemeral as wonder seems an indulgence. What does wonder really have to do with people’s lives? Perhaps not a tremendous amount. But I have to question if we need it more than we think. “Marvel, miracle, (archaic) magical,” says my dictionary. “A cause of astonishment or surprise.” “Star of wonder, star of might,” goes the old carol. “Thou art the God that doest wonders,” reads Psalm 77. Of Isaiah’s several names for Christ, the first is wonderful. The wonder of the shepherds in the Christmas story is palpable, and all who heard their story wondered at it. There is fear, awe and delight wrapped up in the Nativity story. Debates over its historical details are merely interesting; what moves us is the wonder. He learned his sense of wonder from his mother, Catherine, who would point out a glowing moon or a rustling leaf. He’s not sure why wonder is important. He finds gratitude in the memory of his father’s caring hands. I find it, among other places, in our Christmas tree. Outside, it was an ungainly green tangle held upright in a biting wind by a brave tree-seller. Inside, it spreads majestically and glows with a hundred dangling memories. After a day of deadlines, hassles and shoving shoppers, I gaze at our tree and find stillness and wonder. Like deVinck, I’m not sure why it’s important to gaze at a gussied-up tree. But I know without wonder, the days feel mechanical, incomplete and sometimes downright nasty. If you’ve ever felt wonder in a checkout line, let me know. Particularly at this time of year, something more wants to be seen and felt. A brief glimpse of the ongoing miracle of creation; a tiny twinge of awe, fear and delight, gently feeding one’s sense of gratitude that there really is something to celebrate here. 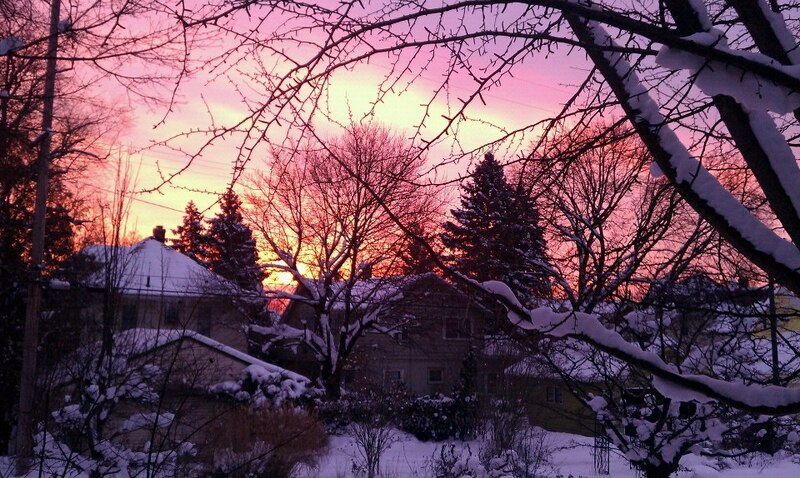 Too often we look right past those wondrous moments, and the goldfish under the ice slips away. From now until Christmas, readers may buy “Faith on First” at a reduced price of $12, and additional copies for $10 each. I will donate half of all proceeds to Access, a food-pantry and hunger relief network in Kent County, Michigan. Email me at honeycharlesm@gmail.com if you would like to order.